It was a momentous day in Greencastle last Monday as a unique, one-of-a-kind fishing boat was launched in the seaside village. 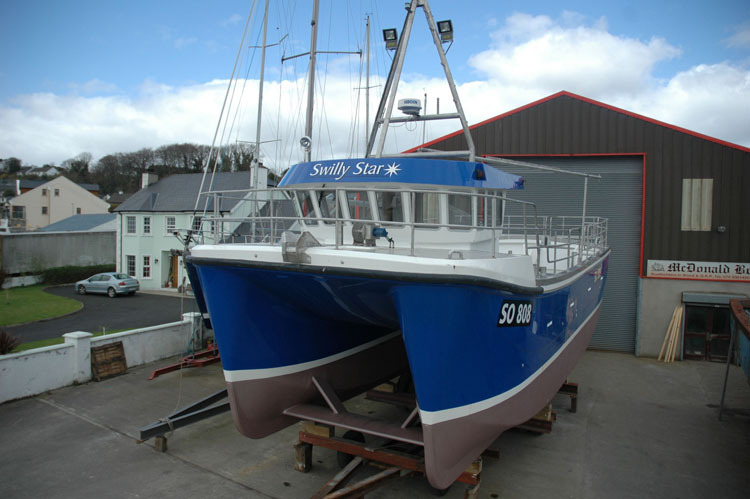 The modern 12 metre ‘Catamaran style’ crabber, built by well known Greencastle boatbuilders, McDonald’s, is the first fishing vessel of its kind in the area. McDonald’s Boatbuilders built the Swilly Star for long serving fisherman, Denis Kearney from Leenan, Clonmany to replace his previous wooden boat of thirty years the Gemini 12. The boat, which was moulded in Scotland and fitted out at McDonalds Boatyard in Greencastle, is currently docked in the pier but Denis is looking forward to getting the crabber out onto the water.